What is a CMH lamp? The CMH lamp is a similar source of MH lamps (metal halide or metal halide), though the MHC bulbs are up to 50% more efficient in lumens and 10 to 20% more efficient in umol / m² PPFD that MH bulbs . The CMH lamps are often used in shop lighting, street lighting, especially in agriculture and intensive horticulture plants of all kinds, the MHC is a technology tested by INRA for plants indoor growing . The ceramic metal halide is a variant of the metal halide metal halide lamp which is also a variant of the old technology and first high pressure technology (mercury vapor lamp first technology creates). A CMH lamp uses ceramics instead of quartz used for traditional lamp MH. The ceramic arc tubes allow much higher temperatures than the tube metal arc, and, most manufacturers, this simply translates to better efficiency of CMH lamps compared with MH lamps, better color rendering, Better color stability and a lifetime of up to 24,000 hours of lighting. CDM or CMH lamps use a fifth of the power of comparable when compared to incandescent bulbs for the same light output of about (80-120 lm / W) and the CMH lamp retain color stability better than most other Gas discharge lamps. Like other discharge lamps with high luminous intensity and high performance, these lamps require a nominal value adapted to the magnetic ballast or electronic ballast to function perfectly without a hitch! The industry is changing, and competition between MHC lamp producers has become fierce. If you always want to grow better, you need to keep up to date on the latest horticultural lighting technology. This means better acquainted with the ceramic metal halide (CMH) latest lighting innovation with LED . The ceramic metal halide, also called ceramic emitting light, are the last-born in the HID lighting . They bring many advantages and only a few disadvantages. What is CMH Grow Lights? The metal halide CMH growth lamps are manufactured with an arc tube consisting of a ceramic composite instead of quartz or PCA. This allows the tube to reach a higher temperature. For a lower operating temperature in HID lamps made with quartz or PCA, use a combination of gases which do not necessarily produce the optimal light spectrum for photosynthesis . The higher operating temperature of the ceramic tube allows an ideal mixture of gas. This creates a more complete spectrum of light that increases growth, overall health and yield of your plants. A special ballast is required for ceramic metal halides. Not just any digital ballast will suffice. MHC lamps require a low frequency, which makes high frequency digital ballasts incompatible. Depending on the quality of the system and where you shop, the full range of CMH configurations ranges from € 200 to € 1,100 with an average price of € 550. Most settings work with a 315W lamp, but there are some devices that have two lamps for a total of 630 W. The lamps themselves cost between 80 and 100 €. The lamps come in two versions: the 3,100 K (full spectrum) and the 4,200 K (blue spectrum).Manufacturers claim that you will only have to replace your lamps every two years. Why buy a CMH bulb or lamp? The money you save on your electricity bill is the # 1 reason why switch to MHC (Grow Light) technology. Although the initial cost of the system is higher than that of other HID systems on the market, MHC systems will save you money in the long run. Some jurisdictions even recognize them as energy efficient lighting systems and offer incentives to offset the initial cost. 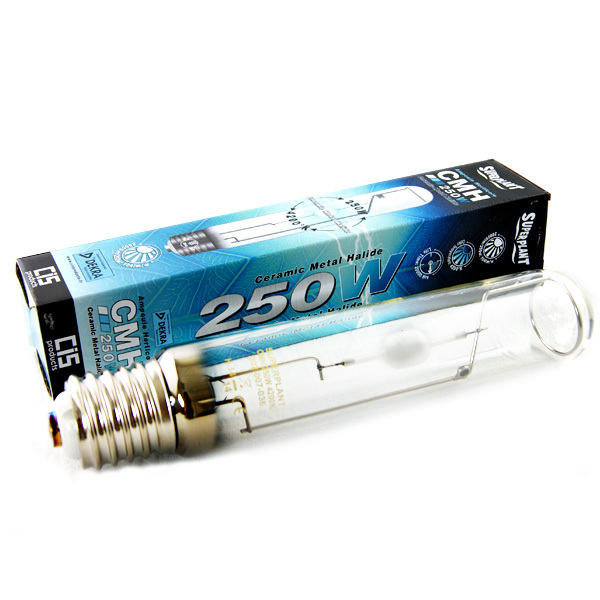 Some vendors claim that the CMH 315W equivalent to a 000W HPS lamp 1 in terms of performance. Others reported that you need two CMH 315W lamps to produce the same outputs as an HPS of 1000 W. The different reports probably have to do with other elements in the garden and the skill level of the Gardener, and the truth is probably somewhere in the middle. In any case, the general consensus is that your output per watt is higher with ceramic metal halides, and that you will be spending far less in electricity to power your lights. These lights also have a low heat output due to their low power. One watt of a growth light creates about 4 BTU of heat that needs to be cooled. Let's say you have a small room with four HPS 1000 watt growth lamps. Your four lights alone create 16,000 BTU of heat that need cooling. If you exchange these lights for four 630-W units, which correspond, if not exceed, your current yields, you will create only 10,000 BTU of heat. Your air conditioner will not have to run as often, and you will see savings on your electricity bill. The JHSC low heat generation make it an ideal choice for small growing spaces such asclosets and growth tents . Another advantage is that with the ballasts required to run them, you will not have to deal with electromagnetic interference (EMI) problems that many farmers are experiencing with digital ballasts. High EMI levels of digital ballasts are known to interfere with cell phone service, radio, Wi-Fi and cable television, and the Federal Communications Commission delivers quotes to people who violate the standards of " EMI. 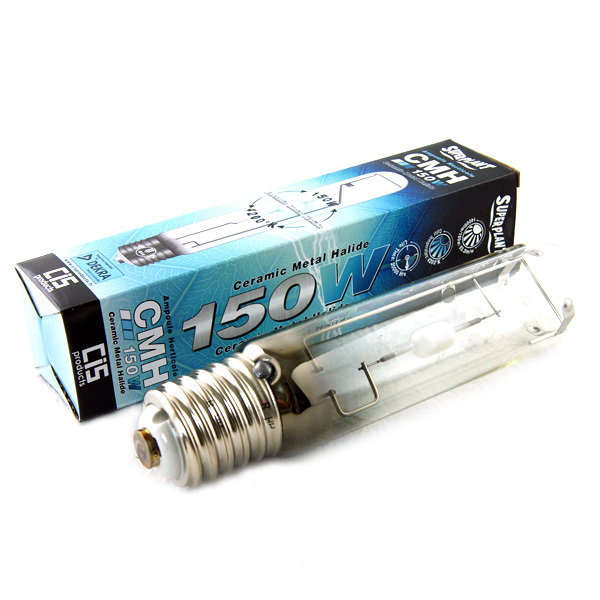 A last advantage of CMH bulbs is their superior light quality compared to other HID lamps, which is due to a few factors. First, they have a wider spectrum than other HID lamps - a result of the almost perfect, unique combination of salts, halides and gases used in the arc tube. This mixture creates a spectrum close to that of the sun and emits a white and dazzling light. In fact, the color rendering index (CRI) for ceramic lamps varies from 90 to 92. To give you some perspective, the CRI of the sun is 100. 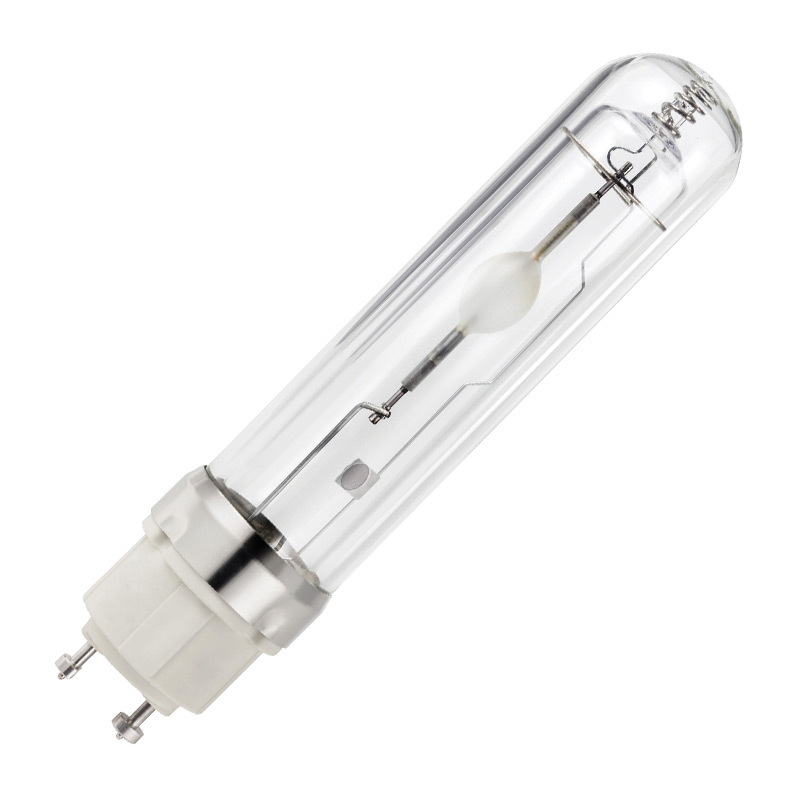 HPS lamps range from 20-30, and the halides Metallic materials range from 60-65. The closer the CRI is to 100, the closer the spectrum is to that of the sun. In terms of light quality, CMH ceramics include ultraviolet and infrared rays in their spectrum, which plants adore. Higher amounts of UV rays create stronger, more woody stems and better structure of your plants. This means that the growth and vigor of your plants will be unmatched, especially in the vegetative stage. Due to the incredible growth that the CMH lamps produce, producers have reported great success when using silica supplements with these lights. Silica helps cell division and creates stronger cell walls, making the leaves, stems and branches much stronger and more resistant to the weight of the fruit. In addition, pests do not like woody stems because they are too difficult to chew. Compare it to eat a tender, juicy steak as opposed to eating a cooked, dry steak. Which do you prefer honestly? Finally, CMH ballasts using square wave technology. When you look at the chart on the back of your bulb's box, notice the high tops and low dips. The peaks are an indicator of energy coming out of the bulb.The low dives indicate the light trying to travel to the next peak. You can see this with your own eyes when taking pictures and videos from your culture room. With most HID lights, you will see strips of light on your photos. The bands of light are the peaks in the graph, and the spaces between them indicate the dips. With square wave technology, there are fewer falls. A more stable beam of light is produced, which means that your plants receive more light throughout their lives. There are two main disadvantages to the MHC lamp, the first has already been mentioned, which is the initial cost. If you are like most producers, you have probably taken the most affordable route for setting up your garden. However, as your knowledge and experience increases over time, you can see the value of upgrading some components in your growing room. Quality lighting offers dividends at harvest time. This, coupled with energy savings over the long term, lower the initial cost of the CMH lamp for many producers. The other disadvantage is that producers should be cautious in the culture room when the lights are on. Many of CMH's growth lights have warnings from manufacturers that suggest that producers should not be around lamps no more than a few minutes, unless the shielding is appropriate or some other protection employed. This is because if the outer envelope of the lamp is broken or punctured, you run the risk of severe skin burns and ocular inflammations due to short-wave UV rays. This is only a potential disadvantage if you enjoy working in your garden for long periods with the lights on. Alternatively, you can work during the cycle of darkness. A green LED flashlight can provide light at night because the green light will not disrupt the natural rhythms of plants. Another option is to use a reflector with a lens covering the bulb, but the disadvantage of this is the reduced light for the plants. It is important to note that, overall, MHC lamps are safe, but it is always better to be safe rather than take risks. So protect your eyes if the product is broken. The net result with your CMH lamps? You should consider switching to ceramic metal halide to increase your yields. You will then be a happy producer to see his own harvest come. Who invented the CMH lamp? The THORN group is the first creator of bulbs and lamps CMH since 1981 to have invented this unique ceramic metal halide technology bringing unique performances. Who was the first distributor in the world? In 1994 philips became the first official distributor of the first CMH bulbs on the international market, sold and classified among the best horticultural lighting. Which MHC models can be found in the trade? Discover the different CMH lamps ranges in indoor growing, your grow shop online for the indoor garden and the intensive cultivation of the expanse. At Culture Indoor there models 150W MHC and 250W MHC (watch only compatible with magnetic ballasts) brand renowned SUPERPLANT lighting , efficient, compatible with magnetic ballasts for perfect and unique performance at an affordable price, HCM technology available for your indoor crops, CMH lamps suitable for your unique lamp kit 1 st price. These hybrid bulbs are equipped with an MH and HPS system. Their broad luminous spectrum is better absorbed by the plant. It is used in growth and flowering, with its 30% of blue in addition. Explore other lamps CMH 315W double-ended, a unique technology. Also available in version of flowering . Find all CMH models in indoor culture, MAXIGROW CMH 315W, DIMLUX 315W, MAXIGROW CMH 630W, CMH 150W SUPERPLANT E40, CMH 250w superplant E40, the bulbs CMH or philips CMD at the best price in our shelves with bulbs CMH, kit lamps CMH . Indoor culture informs you about all the powerful technologies for your plants. What is the difference between metal halide (MH) VS ceramic metal halide (MHC)? * MH: Bulb Metal Halide. Its spectrum is ideal for vegetative growth. * MHC: Bulb Ceramic Metal Halide. Its technology makes it have the same qualities as the MH bulb except it lasts longer, it heats less and lights up more. Technical terms in horticultural lighting will no longer have secrets for you thanks to our vocabulary and our entry lighting *.